Steampunk Magazine » What freedom to assemble? Right now in the twin cities of Minneapolis and St. Paul, marked and unmarked police cars are raiding private homes and buildings (and cars and garages) on a witchhunt for anarchists. [more from Bruce Sterling’s blog] Next week, the Republican National Convention is taking place in St. Paul, and the police are intent on preventing protestors their say. Of note is that they’re mostly confiscating media—zines, books, CDs, computers, mp3 players—, and gathering peoples identities. Of course, they are looking for “bombs” and of course, they won’t find any. This isn’t the 19th century; today, anarchists organize under the banner “food not bombs” as often as not. Why does this matter to you? Because, if you live in the USA, it matters when the government makes preemptive strikes against dissidents. It matters when they are gathering names and taking literature. Anarchists have long been the canary in the birdcage. That canary is choking and coughing and spitting, and it behooves all of us to make this public, to not let people suffer behind closed doors. Oh, and as for what is “anarchist literature”? Well, everything in your house by infamous anarchists Alan Moore and Michael Moorcock, for starters. 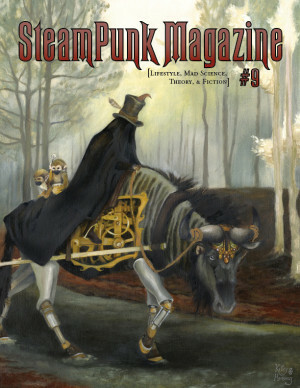 Plus that copy of SteamPunk Magazine #1 you’ve got sitting around your house/harddrive. When anarchists Sacco and Vanzetti waited on death row for a crime they didn’t commit, HG Wells and many other non-anarchist literary folk stood by them publicly. Because back in the day (you know, back in the day that we steampunks interest ourselves so greatly in), the literary world wasn’t afraid of getting mired in politics. We shouldn’t be either. It’s our world and those are our freedoms they’re trampling. I find this absolutely disgraceful in the past decade the amount of things that have happened under the banner of “freedom” is obscene. My American friends have my deepest sympathies and support against a government whose sanity must be called into question. Our government has been moving toward this for years. It is a result of a different loyalty base. The people who become president are part of a political party. This is the only way they can become president. The problem is that they then serve the party first and the country second or third behind themselves. I’ve been finding more stories in the United States with this same plot… recently. I remember the America I grew up in not being like this. Something has gone terribly wrong. Do we live in a facist country now, where women are being shoved around roughly by riot police because someone acted like a prick during a protest? Is our country living in so much fear that the very idea of radical, outside thinking is a threat to national security now? We don’t live in Ireland where Catholics and Protestants are blowing each other up at funerals, or in the middle east where people are blowing themselves up because of their belief of 72 virgins waiting at the gates of eternity for them. When was the last time an American protest became so insane, during the anti-war protest and racial protests of the 60’s? Does our government really fear us this much? Are we people in a country that is starting to lose sight of it’s roots? We’re a country born of the blood of Anarchists, how so easily we forget that. It’s disgraceful! Thomas Jefferson must be turning in his grave. The American revolution is long since dead and gone, and supplanted by reactionary forces that ate it away from within. What a horrid world we live in. Expect to see me at the RNC with a bandana over my face, waving a red and black flag. They can try to hide the anarchists over there, but what do they plan to do about the ones from out of state? Horrifying to know that this is the kind of world we are living in. I read from one of the comments before mine saying sometihng along the lines of “does the government really fear us that much?” If they are doing this- then yes. I believe they do fear us because they know that if people become one group with one movement and they believe in that, we can become a threat. But they should know that if they do this to us, others will hear and they won’t be happy about it because they know, it is possible that it could happen to them to. with that, if things continue as it is everyone’s going to have to notice the elephant in the room because it’s going to trumpet out that constipated sound (not that it is…or sounds like it…maybe it is constipated…I mean, we’re not constipated- no). Am I making any sense? Freedoms in America have been slowly eroding for the last 8 years in large part to the Cheney-Bush team of Fear and Hysteria. To all my friends who laugh when I say I want to move to Canada, looks like I’ll have the last laugh when the US gets 8 years of the McCainnites. sad to say but the people in power were just waiting for an excuse and 9/11 gave it to them. They can eliminate freedoms, dissonance, free speech, protests and anything else they want, all in the name of the “war on terror” and all of the soccer-moms and the “why do I have to worry, I have nothing to hide” and the “if it catches one terrorist it will have all been worth it” people will someday dream of the days they gave their freedoms away. Its just a disgusting downward spiral. NSPD-50 became law a year ago and virtually noone knows about it. Basically the law states that when the country is in a state of “Crisis” (which they left vague and undefined in the bill itself) the president gains control of all branches of government. In other words, a literal dictator. Also, keep in mind we’re due to receive the National IDs with the GPS tracking chips inbedded in them this December. Nothing says Nationalist Police State quite like being constantly monitored by the “authorities.” I wonder if I refuse and they lock me up, if when I try to move to Norway they’ll consider it political asylum. If so that cuts the citizenship wait time in half! It is also evident that whatever we are going to do about it, its got to be more than a culture of showing dissent, its got to be making it with our bare hands. As a first time visitor to this site i thought this was going to be a really cool and interesting site i would enjoy reading…..then i see this liberal piece of crap. bye. I wont cya later. BTW the reason people protesting the RNC had police on their backs is because they were rioting, marching and getting inside the convention and interrupting, did you see republicans doing that? No. We protest respectfully. Thanks Gary. Interestingly, the post I wrote was -before- any of the scheduled protests, and referred to a pre-emptive strike by the police. Secondly, I’d like to draw your attention to right-wing protesters who are not quite as respectful as you’d claim: GodHatesFags, a group that pickets the funerals of gays, come to mind quite readily. Then perhaps the radical pro-life movement, which all over the country assembles to harass, intimidate, and block abortion clinics, targeting some of the poorest and most dis-enfranchised people in the country. And occasionally they bomb the places or shoot the doctors. This isn’t about one side or another having a higher moral ground. Actually, this isn’t about a world with two sides, liberal vs. conservative (yay for dualistic thinking!). Rather, a repressive government that is choosing to crack down on certain dissent while allowing other dissent. I can’t say I’m sorry that you won’t be reading the magazine anymore. Wow. I’m a bit shocked that I’m writing this–and even more shocked that I should need to–but somebody needs to play the devil’s advocate. Since Gary probably won’t be coming back, I’ll speak on his behalf. His point, which he tried inelloquently to make, is that he found the link to this site and came here to share in the thoughts and opinions of others on Steampunk topics. Instead, he found splashed across the front page political invective which ran contrary to his beliefs. It’s your site and you can print here what you wish, but you are only depriving yourself of readers. If your response is to think “I neither need nor want readers like Gary, and I’m better off without them,” then you’re as divisive as any of the protesters or “dualistic thinkers” you mentioned above; and in that case you should consider changing your format from Sci-Fi to politics. People of all sorts come to “Steampunk Magazine” for Steampunk, not politics. Many of your readers may happen to think like you, but your site, and Steampunk in general, would benefit by divesting itself of politics and focusing on the escapism Steampunk is meant to provide. Again, it’s your site, and if you choose to make it a political pulpit then so be it. Just be aware that in so doing, you will in effect be closing ranks with like-minded thinkers and contradicting the diversity you claim to endorse. The hardest part was to sit through all the news programs, all the politicians, all the pundits, listening to them call the protesters Anarchists. No one seems to really understand that anarchy is not chaos, not destructive, violent behavior. Anarchy is not hedonistic, anarchy is civil responsibility in its truest, most fundamental expression. Anarchy is the belief that participatory governance is superior to representative government. That any and all issues that can be decided locally SHOULD be decided locally, and that issues that cannot be decided locally should be decided collaboratively with confederations of local groups. This is not to say that I am against the protests that happened in the Twin Cities. I firmly believe that protest and civil disobedience are very important and necessary to bring about social justice. However, when using protest and civil disobedience one needs to make certain that one isn’t providing a justification for the “righteous indignation” that resulted last month. Think Gandhi and salt production. Think MLK, Jr. and the Bus Boycott or the sit-ins. Don’t give your enemies weapons to use against you. Be smarter than that. The gov’nt, Wealthy, however you want to identify “THEM” will always remain in power, “WE”, will always say that it is fucked up, and it always will be fucked up…but we can always make it uncomfortable for “THEM”and thats kinda fun, eh? Odd that there was no response from the admin based on JC’s post. Frankly, I couldn’t agree more. I see this world slowly slipping away and moving on to something superficial and indifferent… but I don’t see it as the boogey man coming to take my children. It’s a “progressive” trend towards immorality, vanishing of rights, expansion of personal pleasures and further seperation between the classes. It’s not the evil republicans at the RNC. It’s not the current administration, or the new one on November 7th. It’s not the military, the police, or the gangs. It’s all of them, in a way. And it’s you and me. The world is dying, and as much as I’d like to think there’s a head at the end of the snake that’s controlling it all… the further you take your hands and run it down the snake’s body, the more you realize that you’re just going in circles. There is no “One World” agenda. There is no plot by the republicans to take over the world. Underneath that devil’s mask is another mask that looks like my face, and under that… is one that looks like yours, etc. I don’t believe for a second that the US Government is doing what these conspiracy theorists are doing. Simply, because this site is here. You can wake up, type out a blog slandering the government… and go on to live another day. You haven’t been silenced. Nobody’s knocking on your door and stealing your thoughts. In a way, this country is more anti-government than it ever has been… even in the most prosperous times we’ve ever seen (minus the last year, of course) and people STILL think big brother is coming for them. Back in the ’60’s, the public saw the police use fire hoses and attack dogs on peaceful marchers in Selma, AL the public was shocked and they turned in favor of the marchers. But when Anarchist riot in the streets and the public sees them throwing stones at the police the public side with the police. So why shouldn’t I find it ironic, when I read about Anarchist complaining that their civil rights are not being respected under the law? Another response to JC, respectfully, in regards to what steampunk is. It is a combination of two words. If you came here looking for the ‘steam’ part, there is plenty of that to find in articles about gadgets, gizmos, and gaslights. But there is also that ‘punk’ word. Punk is politics, among other things. For example, Punk rock isn’t just rock, it’s politically charged. The politics of steampunk may not be your politics, and that is fine. Everyone has the capacity to read something, even if they disagree with it, and then to choose what to retain. Just like you can listen to punk rock because you like the guitar solos, even if you disagree with the message. If you want to retain just the steam part of steampunk, that’s fine. But this is a steampunk magazine, so there will be punk politics. I don’t think Admin was trying to alienate Gary, but I do think they were frustrated with his lack of an attempt to understand the issue and subsequent brush off of the magazine. They did not actually say “I neither need nor want readers like Gary, and I’m better off without them,” they said they wouldn’t be sorry he wasn’t reading anymore. They aren’t garnering for people to buy the magazine, so they don’t need to taylor to an audience. They write what they write, and if people don’t want to read it, they don’t have to. What they’re saying is they won’t lose any sleep at night for losing a Gary or two here and there. That said, I’m glad you took the time to play devil’s advocate, JC, it shows you’re willing to think about the issue and present your argument in a way that Gary did not. I hope you keep reading the magazine. having just heard of steampunk yesterday (literally) and having been on many sides of many political debates (also at many levels of “society”) i hope that the editors? of the magazine do not shortsightedly discourage some possibly misguided or misinformed people from being readers. Ignorance, though not a social value is a fact in everybody’s lives, and no one needs to make enemies or unfortunate distinctions based on thinking that some people must be more ignorant than others just because of their overt political alignment. If steam -era culture or a reimagination of it is to provide a guide to surviving these days, then i for one prefer not to prejudge anyone for being mistaken in one aspect, because they may be vital and inspiring and non-destructive in others. Let’s keep the possibilities endless. You never know what direction will prove helpful as the surveillance/security state(s) reformulate themselves. STEAM: hot air applied to make life better for ALL. That’s proper Victorian (steam) utopianism . Maybe the Minnesota Police over-reacted because of the demonstrations in Colorado and at the previous Conventions? Maybe we can all breath a bit easier no and get back to Steampunk fiction, not the political hyperbole?